This lovely custom home is nestled high into the Las Cascadas Cove and gracefully extends across a double lot of nearly 1.65 acres of natural desert terrain. Designed by Holden and Johnson Architects, the home's floor plan offers 6,089 SF of living space encompassing both the main residence and the detached 2 Bedroom Casita with Kitchenette. The curvature of the residence allows for an abundance of outdoor living space that opens to a lush glass greenbelt bordered by the desert's flora and fauna. The outdoor living patio area runs the length of the rear elevation of the home and surrounds a circular pool with separate spa and the barbecue dining area. Located at the end of an elevated quiet cul-de-sac, there is a private driveway that leads to the home's entry and two double car garages. 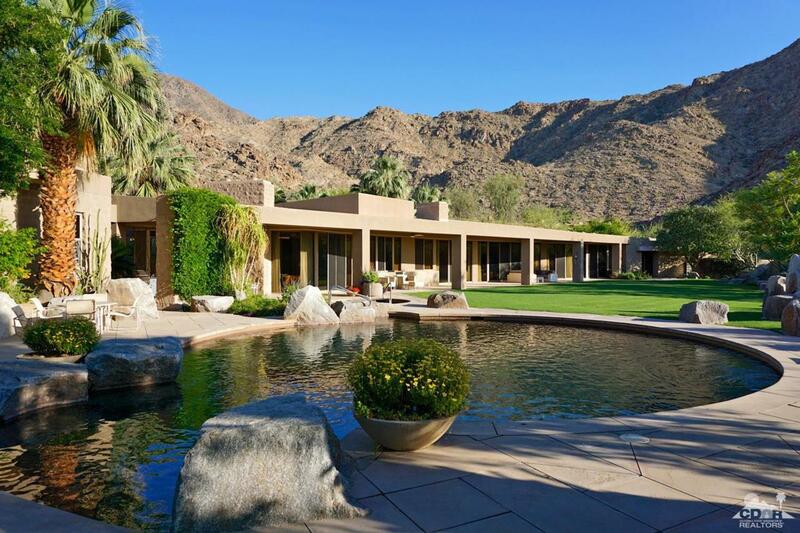 The down valley views are dramatically enhanced by the mountain-scape that surrounds the desert floor.